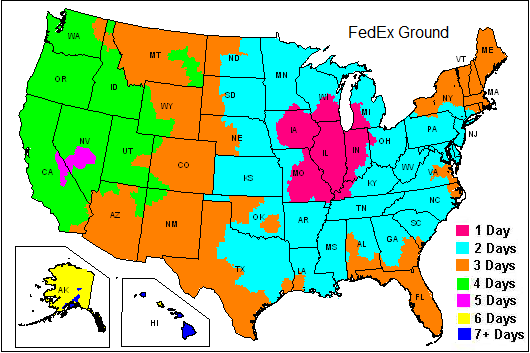 Typical FedEx and UPS Ground shipping rates and transit times for various sign sizes and quantities are shown below. *NOTE: Our “Free Shipping” offer applies only to sign sizes less than 30×30-inch and when the order is $150 or more. It does not include larger signs, posts, sign stands, traffic cones, barricades, brackets, sign bases or similar heavy items. The shipping charge can only be removed after the order is placed and reviewed for eligibility. We then refund the shipping charge for those items that qualify for free shipping. Call our toll-free number 1-800-726-2088 or email TrafficSigns@aol.com for exact shipping cost. Note: UPS and FedEx will deliver posts and barricades up to 8 feet long. Items longer than 8 feet must ship motor freight via semi-trailer.